The brutality of Idi Amin’s (1923?-2003) dictatorship in Uganda was legendary. I vividly recall reading about it in my youth. This early impression was most likely augmented by successful productions for film and TV, namely Irvin Kershner’s Raid on Entebbe (TV 1976), and more recently Kevin Macdonald’s The Last King of Scotland (2006). He took office in 1971 after successfully ousting Milton Obote (President 1966-1971) in a military coupe. According to his BBC News’ obituary, up to 400,000 people are believed to have been killed under his rule. After eight years in office Amin was forced from power in 1979 by Tanzanian troops after which he fled to Libya, then Iraq, and finally Saudi Arabia, where he was allowed to settle in Jiddah provided he stayed out of politics. Although it seems the Saudi government ignored the one known attempt to return to Uganda, in early 1989, getting as far as Kinshasa, Zaire (now the Democratic Republic of the Congo), where he was identified and forced to return to Saudi Arabia. It is widely assumed that Amin’s rule had many lasting negative consequences for Uganda including a low regard for human life and personal security, widespread corruption, and the disruption of economic production and distribution. In spite of having presided over one of the bloodiest rules in recent African history, he never faced trial for his alleged crimes. In this paper, distributed by NEP-His on 2012-10-20, Collins describes the macroeconomic impact of the expulsion of the entire Asian population of Uganda by Amin in 1972. 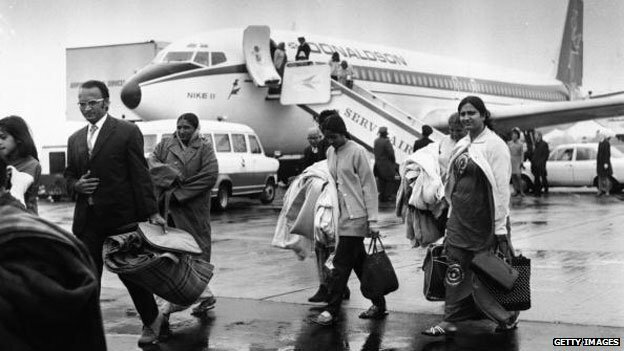 Blaming them for controlling the economy for their own ends, on August 4th 1972, Amin gave all the members of the Indian and Pakistani’s minorities (around 60,000 were not Ugandan citizens) 90 days to abandon the country. Collins’ analysis of this Indophobic episode recalls the expulsion of Jews from Spain in the 16th century and that of the Spanish-born from Mexico in the 19th century. This narrative assumes that specific ethnic cleansing episodes associate with a loss of social and economic capital and as a result, there is a long term weakining of institutions and productive capacity. Collins’ estimates show that annual growth of GDP peaked in 1969, before Amin came to power and three years before the expulsion (see graph below). It then remained flat until he is ousted in 1979. The 1970s was a period of high volatility for the world economy and specially for an oil-importing country such as Uganda. More so if, as it seems, “Big Daddy” was not a particularly dextrous at economic management. Interestingly, however, for the same period GDP per capita also peaks in 1969 and then consistently falls during the dictatorship. Taken together, the trends in GDP growth and per capita income may suggest that the expulsion of Asians adds to a process of wealth redistribution rather than the destruction of productive capacity within Uganda. Of course, causality is hard to ascertain based on simple descriptive series. It would be worthwhile for Collins to develop his views further by moving from descriptive to inferential statistics as well as expanding the database to test not only for the immediate effects of the Asian expulsion but also for its long-term impact. Epilogue: This post celebrates the wealth of opportunities for business and economic history in developing countries and particularly Africa in the contemporary period. In this regard readers are pointed to the forthcoming World Bank Archives Workshop on Using History (which includes a presentation by Stephanie Decker, who has been quite successful in using the archives of the World Bank to reconstruct African history), the musing of Johan Fourie and Taylor & Francis’ Economic History of Developing Regions. Postscript: I was pleasently surprised that this post was re-tweeted by David Birch, who thinks the UK is still benefiting from the arrival of some 30,000 Asian-Ugandans in the mid-1970s. This sentiment was shared and re-tweeted by Andrew Curry. Here is then another angle that could be explored. This entry was posted in Africa, Analytical Narratives, Entrepreneurship and tagged Africa, economic history on 2012-10-30 by bbatiz. This paper examines the effects of the Reconstruction Finance Corporation’s (RFC) loan and preferred stock programs on bank failure rates in Michigan during the period 1932-1934, which includes the important Michigan banking crisis of early 1933 and its aftermath. Using a new database on Michigan banks, we employ probit and survival duration analysis to examine the effectiveness of the RFC’s loan program (the policy tool employed before March 1933) and the RFC’s preferred stock purchases (the policy tool employed after March 1933) on bank failure rates. Our estimates treat the receipt of RFC assistance as an endogenous variable. We are able to identify apparently valid and powerful instruments (predictors of RFC assistance that are not directly related to failure risk) for analyzing the effects of RFC assistance on bank survival. We find that the loan program had no statistically significant effect on the failure rates of banks during the crisis; point estimates are sometimes positive, sometimes negative, and never estimated precisely. This finding is consistent with the view that the effectiveness of debt assistance was undermined by some combination of increasing the indebtedness of financial institutions and subordinating bank depositors. We find that RFC’s purchases of preferred stock – which did not increase indebtedness or subordinate depositors – increased the chances that a bank would survive the financial crisis. We also perform a parallel analysis of the effects of RFC preferred stock assistance on the loan supply of surviving banks. We find that RFC assistance not only contributed to loan supply by reducing failure risk; conditional on bank survival, RFC assistance is associated with significantly higher lending by recipient banks from 1931 to 1935. The systemic risk of bank failures, and its macroeconomic consequences, led the Fed to take action when some banks started to fail in 2008. How much money did the Fed give to the banks in 2008? And even more important, was this money helpful to avoid banking failures? The latter question seems to be a key question every time that the government is implementing a program to try to stem bank failures and to reduce the economic cost of financial disintermediation. The paper by Calomiris, Mason, Weidenmier and Bobroff, distributed by NEP-HIS on October 6th,2012, assess the success of a public support program aimed at banks in financial distress. This through assistance provided by the Reconstruction Finance Corporation (RFC), ,a government-sponsored enterprise, to Michigan’s banks in the 1930’s. Calomiris and friends offer a very interesting description of the timing of the crisis and a regression analysis of the impact of the RFC assistance. The period of analysis, from January 1932 through December 1934, covers two sub-periods: the first in which bank failures occurred sporadically; and a second sub-period in which the failures were concentrated and coincided with regional and national panics. 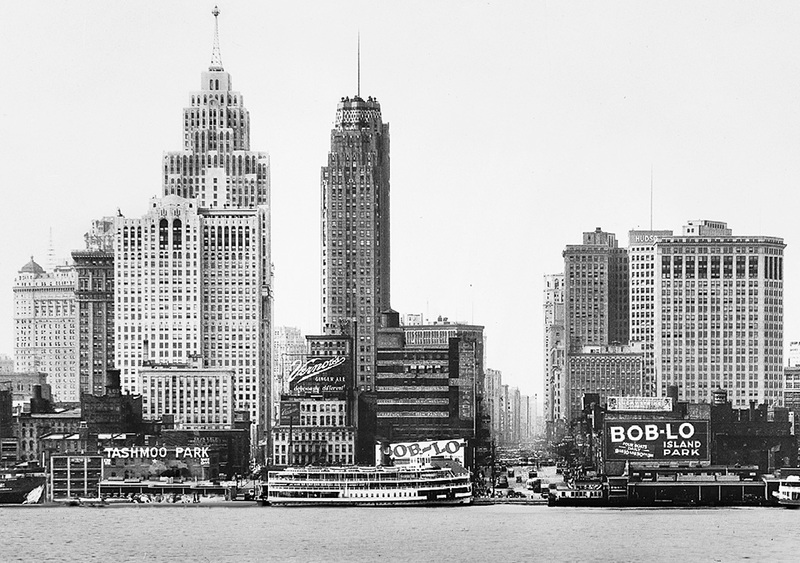 The banking crisis of 1933 in Michigan is situated in the middle of the period of analysis. This is a very important episode as it can be seen as a prelude to the national banking disaster as well as the Michigan hosting the automobile industry, an industry on the raise and of future importance for the national economy. The role of the RFC changed between the two sub-periods. 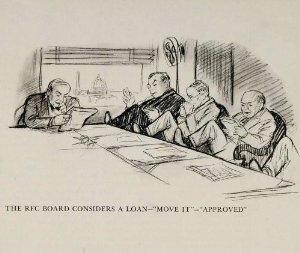 During the first period, the RFC main action was to help banks advance money on loan. The risk involved in these loans was mitigated through their short duration, strict collateralization rules and high interest rates. Although these rules protected the RFC from losses, they also limited the effectiveness of the RFC lending policy. However, on March 9, 1933 the Congress passed an act altering the original mandate, allowing the RFC to purchase preferred stock in some financial institutions that were considered as likely to survive. This opened the possibility for the RFC assistance to be more effective in the second sub-period than in the first one. Econometric estimates then try to identify the effect of RFC assistance. Specifically whether in light of an increasing rate of bank failures, the federal government had decided offer support to banks with greater risk of failure. In this sense, the dummy variable of RFC assistance is an endogenous variable, and this problem has to be addressed in order to consistently estimate the effect. To deal with this problem, the authors use two different estimation techniques and they use two sets of instruments. First, they use a set of instruments that indicate the correspondent relationships of each bank, that indicate the extent to which the bank was important within the national network of banking and also the correspondent relationships with Chicago and New York. Second, they included county specific characteristics that might have affected RFC assistance without affecting bank failure risk. The authors conclude that the loans from the RFC did mitigate the risk of bank failure but rather, that recapitalization (in the form of the purchase of preferred stocks) increased the likelihood of bank survival. Reasons why preferred stocks assistance was more effective included: a) because unlike loans, it neither increases the debt of the bank nor the liquidity risk or collateral requirements, b) the RFC was selective when choosing who was included in the program, and c) the RFC was able to prevent abuse from assisted banks. In general, they conclude that these results suggest that during a banking crisis, effective assistance requires that the government takes a significant part of the risk of the bank failure. Emprical estimates in this paper concur with previous results in the literature. But by incorporating Michigan this papers offered added granularity and also improves in the use of econometric techniques used to address the issue of the effect of the RFC in banks failure. However, I think the paper could be improved by a more thorough discussion of the instruments used, in terms of why they can be assumed to be related to the RFC assistance and not directly related to bank failure. This is especially important because the results of the first stage estimations cast some doubt about the suitability of some of the instruments selected. Regarding the first set of instruments, one variable indicates the connections of a bank within the national network of banking and another one the relationships with Chicago and New York. However, in the first stage the effect of these two variables over the RFC assistant have different signs and their statistical significance depend on the period and specification of the model. A second concern is that they use the variable “Net due to banks over total assets” but this instrument is not significant in any first stage estimate. Banks with more creditors or debtors could be more important to save, but it could also be the case that these banks are more indebted with other banks because they are facing problems and thus they have more risk of failure. Regarding the second set of instruments, these variables generally fail to be consistently significant and the mechanisms through which they affect the decisions of the RFC without affecting the hazard of failure are not completely clear. Was the main proportion of the business of the banks concentrated at the county level at those times? Does the political importance of the county matter to allocate the assistance, even when the authors say that the manipulation of the RFC by Congress or the Administration was mitigated? Is the unemployment rate in the county in 1930 unrelated with the risk of failure of the banks during the crisis? A more deep consideration of these issues could help to understand why these variables are good instruments and why the results of the first stage estimations look like they do. To sum up, this paper provides new evidence about the role of the RFC during the important period of 1932-1934. Furthermore, this paper addresses an issue that is relevant today: the efficiency of public funds to avoid bank failures. The general conclusion the authors achieve is that an effective assistance involves that the government assumes a significant share of the risk of bank failure. 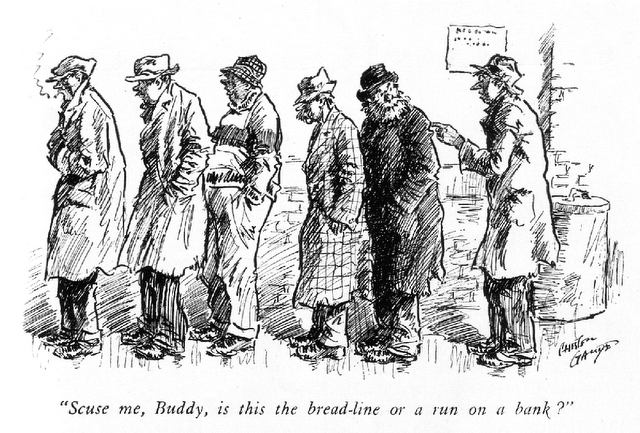 As in the thirties, in the present the government has spent lots of money trying to avoid the systemic risks related with the failures of some banks. This and other related papers in the literature can help us to understand the effects of a banking crisis in the real sector and the efficiency of public policies that try to reduce its negative impacts. This particular historical experience can not only shed light about what happened in that opportunity but also give us insights to approach these situations when they appear again, in particular to design better economic policies. This entry was posted in Money & Banking, USA and tagged business history, economic history, financial history, USA on 2012-10-19 by sebastianfleitas. Abstract: This article provides an historical overview on the development of Chinese money and monetary regimes between about 1800 and 1950. It develops a simple conceptual framework based on the relative costs of assessing the inherent value of the currencies of different denomination. Based on this framework, I develop a historical narrative that ties important political and institutional changes with the evolving structural changes in the Chinese monetary regime marked by the vicissitudes in the use of copper, silver currencies and paper money in both the private and public financial sectors from the Opium War in mid-19th century to the end of the Civil War in the 1950s. 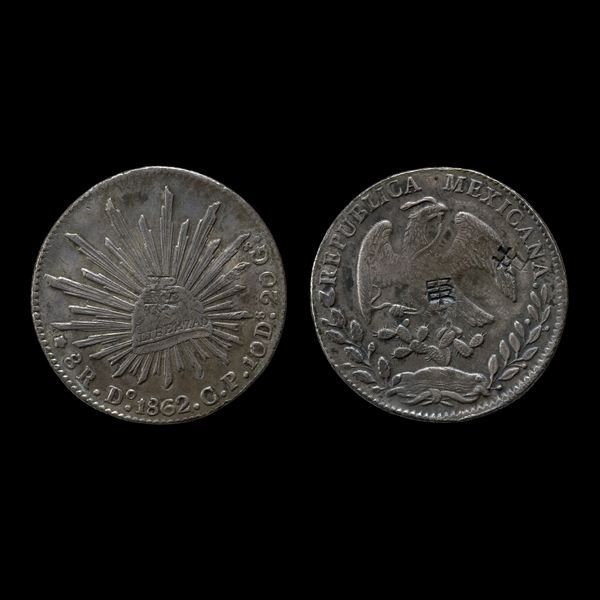 Silver 8-reales of the Mexican Republic with Chinese chopmarks, made in Mexico and circulated in China. British Museum, CM 1920-9-7-343, Room 68: Money. China was the first country to have coins, or the first along with Lydia in Asia Minor; the first to have paper currency, free banking (competitive issue of notes), and a government monopoly of paper currency; perhaps the first to have a kind of currency board (circa 1270); and a pioneer in some fairly sophisticated forms of exchange control. – Schuler (2012). This paper, distributed by NEP-HIS on 2012-02-27, offers both a conceptual framework (based on politics and geography) and a historical overview of monies/money and the monetary system of China. As was the case in most of the world, diversity and concurrence of several monies prevailed in the Chinese monetary system well until the 20th century. A bimetallic, commodity standard prevailed, with silver bars named tael (or liang) as the main reference unit, convertible with a “fixed” price in official copper money, and copper cash coins strung together named tiao (or chuan), whose value fluctuated across regions, time and trades. Spanish American silver dollars also circulated widely (with chops of local assayers) since the 16th century (see an example above). Imaginary units of account, denominated in either silver bars, copper cash or silver dollars were the effectual anchors of the system. The most successful units of account, the Kuping tael and the Haikwan tael, were used for the payment of direct and custom taxes across the empire, but even those standards were challenged across the territory. Currencies were traded with a “nearly infinite set of cross exchange rates” (Ma 2012, 5). This entry was posted in China, Economic History, Money & Banking on 2012-10-10 by Manuel A. Bautista-González. Yonekura also suggests that, ‘few studies have attempted to empirically verify the role played by the samurai class in dismantling feudalism and promoting industrialization’ (p.3). The double creative response which the author refers to means (1) ‘the creativity of Restoration officials in institutional reform’ as represented by ‘the issue of hereditary pension bonds’ to eliminate the heredity stipends paid to the former samurai class and the creation of ‘a lending facility to provide necessary funds to the samurai entrepreneurs and (2) ‘the creative corporate activities of the former samurai class’ as represented by Junpachi Kasai’s tactfulness in establishing and managing Onoda Cement, the subject of Yonekura’s study. The hereditary pension bonds was the public loan delivered by the Meiji Restoration as the compensation to the noble families and the samurai class that returned hereditary stipends in accordance with the abolition of the system. Therefore, as the author states, ‘the Meiji government purchased the privileges and status of the former samurai for a lump sum payment of 170 million yen, and the samurai likewise sold their status to the new government for that amount’ (p. 6). This exchange was disadvantageous of the dealings of the samurai and they became further destitute economically through the inflation brought about by the accelerated issuance of inconvertible paper money. This was made worse by increased dissatisfaction with the new government. To avoid the risk of rebellion, the government implemented the ‘Samurai Relief Plan (shizoku jyusan)’ to encourage (or redirect?) the samurai to have them work in industry by creating the system of a lending facility. As suggested in the title of the paper, it is considered that the success or failure of the author’s attempt relies on the extent of Onoda Cement representing the ‘samurai company’ and depends on that of Junpachi Kasai, the founder, representing the ‘samurai entrepreneur’ of those days. It can be said that the former is based on the ability to present more comparative cases other than Onoda Cement and the latter depends on the quality and quantity of evidence to confirm the extent of which Kasai actually shared the consciousness as antigovernment element with other complaint samurais besides his own statement “shamed by their births as samurai” (p.14). This paper will serve as a new contribution in these days when the relevance of the Samurai Relief Plan for the management of Japanese enterprises is being reexamined as represented by the example of Okamoto’s (2006) latest work. This entry was posted in Accounting History, Japan, Masayoshi Noguchi and tagged accounting history, business history on 2012-10-02 by bbatiz.